Starting with the Bay, there are indications from the IMD and ECMRWF and other international models of the formation of the 1st. pre monsoon low. This is forecasted to form end April, and could well turn into a depression. 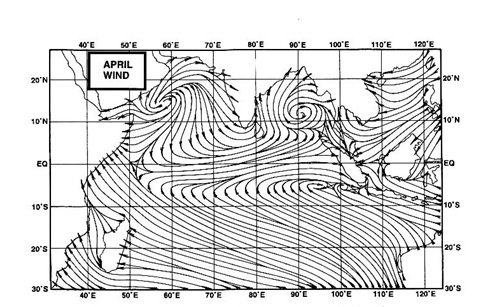 Not many models predict its movement into the coast of India. Rather all suggest it crossing the coast of Myanmar/Thailand around 3rd. May. This could well be true, as a high aloft in the region of central India, and with a clockwise circulation aloft across the east coast of India will prevent any system in the bay from moving westwards. The water temperatures in the Bay are around the normal levels of 30-31c. Both the above are reasons for holding the system from reaching the cyclone level. The first week of May is an "on schedule" date for the pre monsoon low in the Bay. But the mainland continues to heat and the map from IMD shows a huge "above normal" re gion (though not a heat wave yet). Highest today was 45c at Akola(India) and 46c in Nawabshah (Pakistan). Though not yet formed, and at 1004mb today, the seasonal heat low over the regions of Rajasthan/Sindh could well form around the 1st. week of May. For this, more day and night heating is required, especially in the Sindh regions of Pakistan and Rajasthan in India. Required to be ready by the end of May, the seasonal heat low should be (by May end) at 994 mb and stretch from Rajasthan in the east to Arabia in the west, with Jacobabad at its centre. The streamline map shows the wind discontinuity to be firm now in the southern peninsula. The easterlies therein bring in the required moisture in the peninsula regions. The mentioned low is also seen forming in the south bay . All indications as yet are for the monsoon to hit the Indian regions around the due dates. That is Andaman Sea around 16th.May, SriLanka by the 25th. and Kerala around 1st. June. I am a doctoral student, studying at the Ferkauf Graduate School of Psychology at Yeshiva University, Bronx, NY. I am conducting a research project on the topic of blogging and would like to invite you to participate as a subject in my study. Ferkauf faculty member Dr. Shelly Goldklank is supervising this project. You have been selected for participation in this study as part of a random sample of bloggers. I would greatly appreciate your assistance in completing a questionnaire regarding your use of your blog, as well as an online survey of your personality traits. Additionally, I ask for demographic information, such as age, gender, etc. After I receive your answers to the questionnaire on your blog usage, I will contact you again to review your responses or to ask new questions that arise from your initial responses. The time to complete the entire survey is about 30-50 minutes. This study has been reviewed and approved by the Committee on Clinical Investigations Institutional Review Board at Albert Einstein College of Medicine of Yeshiva University. To participate in this research study you must be at least 18 years old. You must also be a blogger who updates your blog at least weekly for a minimum of 3 months. At least one of your blogs must be public. Your participation in the study is voluntary. Your identity will be kept confidential and data referenced in the final results will be stripped of identifying information. Your name and contact information will be kept in a locked box for the duration of the research study and this same contact information will be destroyed six months after completion of the study. The research study will be completed June 2008 at the latest. Within six months after the completion of the study those subjects interested in obtaining the results may receive them at the end of the study, at which time I may retrieve the names and addresses from the locked file. There are no direct benefits to all participants in the study. Your completion of the on-line survey will indicate that you have read, understood, and agree to the terms of participation in this study as outlined above. If you are interested in participate in this study, please email me at chrisbelz@gmail.com. I will then email you a link to the online survey, as well as the questionnaire I have designed. Thank you again for your assistance with the completion of this research project.